In September Juan Soto, Access MVP, presented at the Chicago Access User Group (CAUG), on the topic of Stored Procedures in MS Access. Once again he will be sharing his knowledge on this subject by speaking at the Access User Group meetings for Latino and España. Both these meetings will be held in Spanish. How to use stored procedures as a report source or as part of your code. 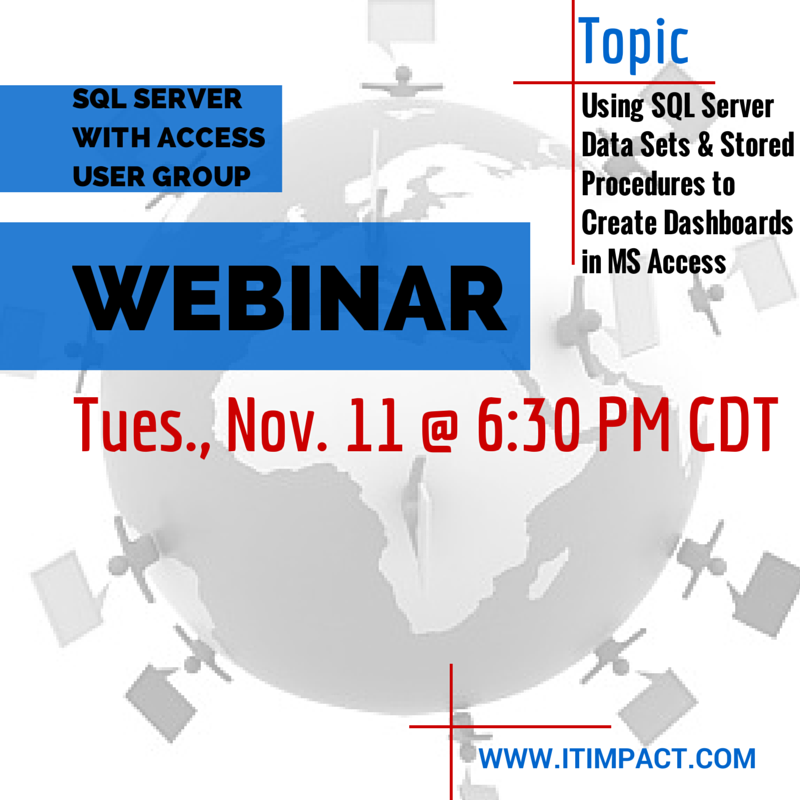 How to maximize performance between SQL Server and Access. It this is a topic that interests you, and you have not yet done so, register with the group to receive information of future meetings. This is our regular monthly meeting link. 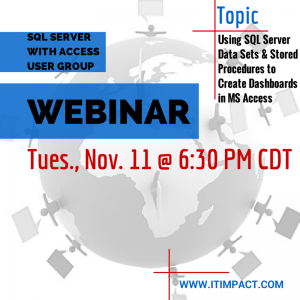 Ben Clothier, Access MVP and co-founder of the AccessUserGroups.org, will be presenting at this month’s meeting for the SQL Server with Access Group. 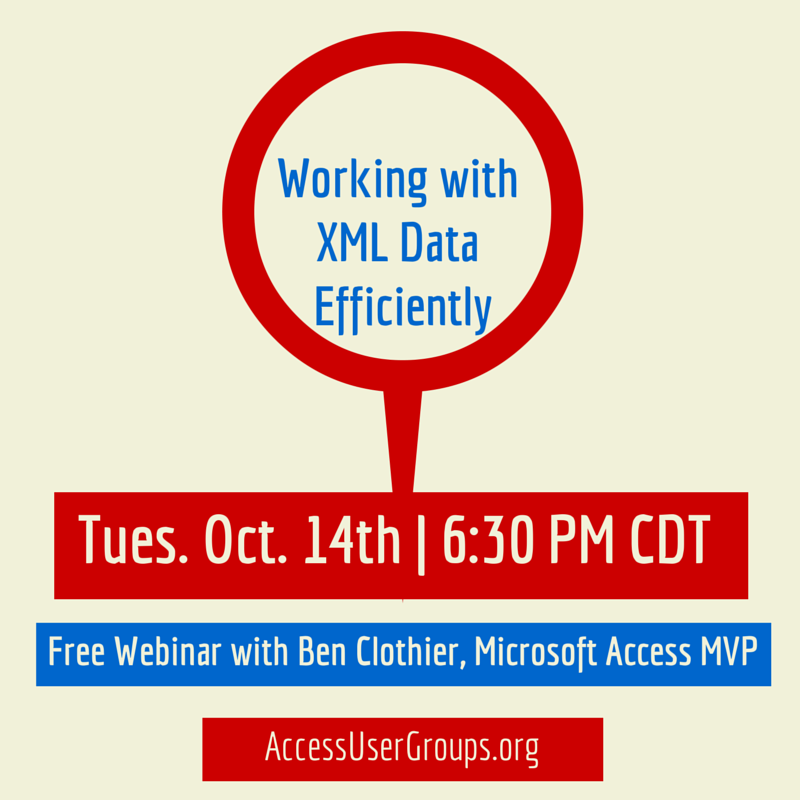 He will discuss working with XML data with an SQL Server backend. How to use XPath and XQuery to query a XML document. 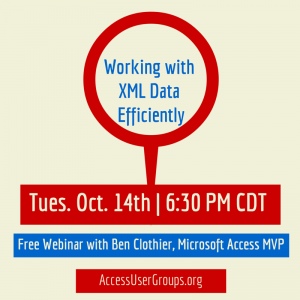 How to use XML like a relational data source. How to build a valid XML document in VBA with minimum code and especially without knowing the schema?. How to post a XML document to a stored procedure in VBA?. Please add this to your calendar and tell your friends! I’ve been asked by the Denver Area Access User Group to present on starting or improving your consulting practice: “Wish you could live the glamorous consulting life?” Here are the details, please register if you plan on attending! Speaker: Juan Soto, Microsoft Access MVP, President IT Impact, Inc.
Topic: Wish you could live the glamorous consulting life? Consulting is a great career choice, from the increased pay, (sometimes less), to the flexible hours, (working nights and weekends), you will work with a wide range of customers, (if you can find them), that will lead you to wonder why you didn’t start earlier? (and walk away from a cushy job). Juan says that he would not trade his consulting career for any other choice; he loves the rewards and the freedom it provides him, but he has learned the hard way. In this session you will learn sales, marketing and management strategies to get your practice off the ground, sand traps to avoid along the way and a honest, down to earth assessment of the consulting life. An essential session for those thinking about this choice and/or those who are just starting out. Note: Even when an IT person has a permanent position, they are usually on a separate career track from non-IT personnel. This session will provide tips for all IT personnel.